The following is a list of common questions we receive about applications and the products. This is well worth a two minute read if you're planning on epoxying your floor. Please don't think you can just go down to your local store and buy any ole epoxy sitting on the shelf with a couple of rollers and slap it down on the floor. You will be sorely disappointed in a very short time when your epoxy floor fails. This page and several other pages on the website have lot's of information on them so you know the differences between the various epoxies that could save you from making a costly(both in time and money) mistake. Q: Do I need a primer and a topcoat and what's the difference? A: Here are some quick ABCs in epoxy. A primer is usually a thinner coating designed to penetrate deeper into the concrete pores to seal the surface and to provide better adhesion. We recommend primers for all commercial and industrial applications, if the budget allows for it then do so for residential applications even though it's not necessary it never hurts. Epoxies come in several different versions which you will read more about below. The most important thing to know is that Epoxy coatings and Topcoats are NOT the same! Epoxies are made to either go directly onto concrete or over primers and provide thickness and a foundation against Hot Tire Lifting and Impacts. Topcoats have one main function in life and that is too provide durability against abrasion. That is why they are a much harder surface than epoxies due to being Urethane fortified. You must have a Urethane fortified Topcoat with an abrasion rating of 20mg or LOWER! Beware of clear versions of epoxies being sold as a Topcoat, these are worthless and a complete waste of your time and money, besides abrasion, real Topcoats provide UV protection! Q: How does your epoxy compare to a Cycloaliphatic epoxy? A: Cycloaliphatic epoxies are a Hybrid epoxy developed to be a lower cost substitute for Aliphatic epoxies. They do this by being a sort of all in one product that includes minimal amounts of everything and eliminates the protective topcoat. Thus they are known as a thin build epoxy usually under 10 Mils in thickness versus our epoxies which are high build epoxies such as our Ultra at 23 Mils thick. As with most all in one type of products they do many things but cannot and do not do them as well as individual specialized components. The fact is that they are completely inferior to an Aliphatic epoxy with a Urethane Fortified Topcoat. Cycloaliphatic epoxies as with ALL solids based epoxies are not UV stable. You must have a Urethane based topcoat to provide UV protection. Cycloaliphatic epoxies will ALL yellow or amber when exposed to even small amounts of sunlight, that's an epoxy chemistry fact! That's why they don't offer any guarantee against Yellowing or Fading. Cycloaliphatic epoxies aren't as hard or durable, again you need a Urethane Fortified Topcoat to provide the maximum durability, impact resistance and gloss retention. Simply put Urethane is to epoxy as what rebar is to concrete! Without it you have an exponentially weaker product. That's why they don't offer any guarantee against wear. See the Abrasion & Impact ratings in our Epoxy Comparison Chart for further indisputable proof. When our Urethane Fortified Topcoat bonds with our high grade epoxy base coat it becomes a true epoxy coating that cannot be equaled! All our epoxies use military grade resins and are engineered to stay looking new for 10-20 years. That's why we are the only epoxies guaranteed for 7 years against wear. Cycloaliphatic and water based epoxies are only guaranteed against peeling, not much good when they wear out and turn yellow a lot sooner than you ever expected. Q: How quick can I get one of your epoxy kits? A: Standard colors ship out the next day by FedEx or UPS ground. Q:Are water based epoxies better for the environment? A: Water based epoxy companies make misleading statements by claiming their epoxies are safer for the environment. Typical water based epoxies in addition to being inferior epoxy, they are not better for the environment! They contain 1 lb of VOCs per gallon of epoxy. Armor Ultra, Armor Chip, Armor Granite and Armor Basement Paint all contain ZERO VOCs! It's pretty clear which is better for the environment! Q: What is Hot Tire Lifting? A: Hot Tire Lifting is when your hot tires come in contact with a thin epoxy coating of low quality, the heat from you tires reactivates the curing process and the epoxy begins to revert back to it's liquid state and then gets stuck to your tires. We get dozens of calls everyday from people that bought inexpensive Home Improvement Center kits or water based epoxy kits and had the coating destroyed on the first hot day. You don't want that happening to you! All our Epoxy kits are engineered and guaranteed 100% against Hot Tire Lifting. Q: I bought another brand epoxy kit and it's now peeling and cracking up, can I coat over it with your product? A: Most of the so called epoxies out there are nothing more than Latex or Enamel floor paints with some epoxy additives. That's why 99% of them fail but yes you can coat over them if you remove the failed paint or about to fail paint. Power washing and scraping is one method. This usually does the trick since most epoxies are low quality and paper thin. Another method is to rent a floor prep machine from your local Home Improvement Center or a tool rental company for about 100.00 for the day. It won't get 100% of the epoxy off but that's OK. It will remove all the epoxy that is not properly adhered. Give any remaining paint a rough sanding and power wash, then etch the entire floor with our etching solution and rinse well with a garden hose then do a final rinse with the power washer. Any remaining paint and concrete is now ready for coating with our epoxy. One final point, during this process it's essential you remove any oil stains. For this you will need a good quality degreaser. Q: My garage has a low curb around the perimeter and 2 steps leading into the house. Can your epoxies be applied to the vertical surfaces? A: Yes, our epoxies are not water based and adhere extremely well to all vertical surfaces without running or dripping. This applies whether your using just epoxy or epoxy with the colored chips. we recommend you use a good quality brush on the vertical surfaces. Brush marks will disappear as the epoxy cures. Q: How do I really know your kits are the best and what's the difference between your epoxy and Home Improvement Center type epoxies? A: This is a question we get asked often and the short answer is we manufacture our epoxies with the highest quantity and the highest grade epoxy resins, polymers, hardners and pigments available. We don't use water or cheap filler chemicals to water down our epoxies so that they sell at a lower price. Water and substitute chemicals means a lower price but also means less resins, polymers, pigments and hardeners in your epoxy which means less quality and early failure. 1. Is the epoxy I'm considering, water based such as many of the brands available in Home Improvement Centers? ArmorGarage will not sell any water based epoxies! Is the epoxy you're considering have substitute chemicals added in to water it down? This results in a sub 10 Mil thick coating with inferior performance ratings. All our epoxies are pure solids based two part epoxies with no added substitute chemicals either in heavy duty or extra heavy duty grade such as our Armor Ultra. While most water based epoxies and epoxies without topcoats are well marketed with low prices, they are all prone to a high rate of failures. In fact most of our customers are ex users of those type of epoxies. 2. What is the guarantee of the epoxy I'm considering? Our epoxies are the only ones guaranteed against wear! All our epoxies are engineered with a 20+ year life expectancy. Lifetime guarantees are just slick marketing fluff that usually exclude just about everything except peeling and have almost impossible qualifying technicalities resulting in you having no real guarantee(read the fine print). Why don't other epoxies guarantee against wear? Because most other popular epoxies are made of lesser quality and amounts of key ingredients, especially the "all in one" type epoxy coatings. They have just enough of everything in them to make certain marketing claims but are watered down with substitute chemicals resulting in a poor product chemistry that just can't hold up to everyday Vehicle Abrasion, these type of bargain coatings tend to dull and wear out in a lot shorter time frame then you expected. This is the one reason to buy an ArmorGarage kit. 3. What are the specifications of the epoxy I'm considering? Kits with exaggerated coverages and inferior chemistry result in a paper thin covering guaranteed to fail! ArmorGarage's epoxies give you the thickest final coatings with the best Specification ratings for Abrasion, Impact, Glossiness and Adhesion! These are the FOUR most important factors to consider when purchasing any epoxy paint! Anyone can say what they want about their epoxy but if you start with an epoxy that is a thinner coating with a softer final cure, lower impact ratings and lower adhesion which epoxy do you think will last longer on your floor, theirs or ours? If you take a moment to study the: EPOXY COMPARISON CHART you'll notice that most other companies don't even have specifications for their epoxies! What are you buying if you purchase one of these products other than a low price and some good marketing?? Our epoxies will not dull from tire abrasion, will not experience any hot tire lifting and will never peel, crack, fade or yellow. 4. How do you know you are applying the epoxy at the right thickness? ArmorGarage kits are the only ones with a calibrated notched squeegee so that you spread the epoxy at the right thickness automatically. Assuring no thin spots that are prone to failure. 5. How many pounds of chips are you getting? Armor Chip and Armor Granite provide you with the most amount of chips by a factor of up to 6 times more. 6. Are you getting a topcoat? All ArmorGarage kits are supplied with a topcoat, it's a must have and should not be an option, we cannot stress this point hard enough! This is the single biggest mistake most people make when coating their floors with epoxy, not using a Urethane fortified topcoat, it's a guarantee to premature failure no matter what anybody tells you. Please note that any and all epoxies with any amount of solids in them will Yellow without a protective Urethane Topcoat. There is no if ands or buts about that, it's indisputable epoxy chemistry and anyone telling you otherwise doesn't know what they are talking about or isn't being truthful. Also if you are applying decorative chips, know that the chips do not fully embed themselves into the epoxy and have millions of tiny raised edges. These raised edges will collect dirt and grime making it a nightmare to keep your floor clean. Not to mention that common sense tells you that exposed flakes cannot withstand the abrasion from your vehicle's hot tires! EPOXY COMPARISON CHART before making any purchase so that you know exactly what you are buying before you buy it. Q: How difficult is it to apply your epoxy kits, I have no experience. Also what can I use to clean up any splatter or spills? A: No experience is needed. We have sold more DIY epoxy kits than anyone by a three to one factor so we know what the novice epoxier needs and have designed our kits assuming you have never done this before. As long as you've used a roller before and can follow clear & easy instructions it is basically fool proof. The important factors in a successful epoxy job are as follows: Be sure your floor is clean of all dirt and stains then prep the floor with the etching solution provided, let the floor dry completely, mix the components of the epoxy accurately and thoroughly. If you do the above your floor will turn out perfect, it's as simple as that. Watch this Video and see how a couple of High School kids did their garage. Epoxy Video. If you accidentally splatter one of our epoxies on something, simply wipe clean with paint thinner or Xylene(available at Home Depot/Lowes) before it cures. Do not let the epoxy harden! Once cured there is no way to remove our epoxy other than by grinding. Q: Can I epoxy over existing VCT Tiles? A: Yes, we suggest you purchase our Coat-All Epoxy Kit. It's the thickest epoxy and is best for covering VCT tiles. Encapsulating old VCT tiles with our Coat-All Epoxy is a cost effective way to deal with VCT tiles containing Asbestos which is dangerous to handle and costly to dispose of. Please note that you need to secure any loose tiles, patch any missing ones and either acid etch or sand them to provide a clean rough surface for the epoxy. If your tiles contain Asbestos please do not attempt to sand them, a good acid etch to strip and clean them will suffice. Q: Why must I etch the floor and why should I spend money on a topcoat? Also does your epoxies require an induction time after mixing? A: Great questions! If you don't etch the floor you will not be removing all the dirt and curing residues that have been grounded into your concrete. 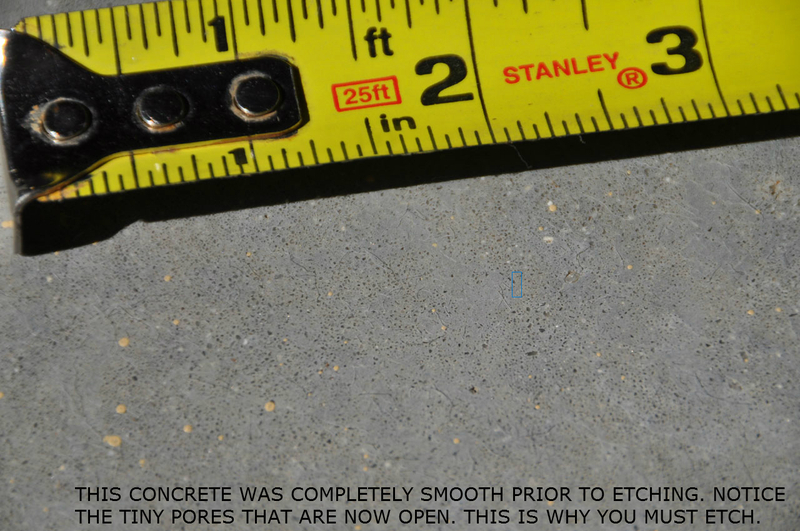 You will also not be opening up the pores of your concrete. Not getting the floor properly clean and opening the pores will prevent the epoxy from adhering to your concrete properly and the epoxy you put on your floor will peel up in a very short time. In other words you will be wasting your time and money if you don't etch. If you are grinding your floor, great, but since etching is such a quick and easy process it's still a good idea to etch to open the pores of the concrete. Regarding the topcoat we cannot stress enough how important the topcoat is. Our Urethane fortified topcoats when bonded to our epoxy base coats provide you with UV protection and increased durability far beyond any epoxy only coating. No reputable epoxy installation company would ever do a job without applying a topcoat and neither should you. Induction time is the time you need to wait between mixing the epoxy and applying it. Any epoxy requiring an induction time is an epoxy to stay away from. That is the sign of a cheap low grade product, none of our epoxies require any induction time. After mixing our epoxies you can immediately apply them to your floor. Q: Do I have to use the non skid additive? A: No you don't. Most nonskids are low grade grit and not worth much. But our non skid additives are very high quality and actually reinforce the topcoat making it even more durable. Plus they will not yellow or wear out of the topcoat. We recommend the use of the nonskid also because it prevents slips on a wet floor. Remember when our epoxy fully cures it's a poreless high gloss surface which will get slippery when wet. If your floor will not be getting wet much then you can omit using the nonskid. Q: Why are the ArmorGarage kits more expensive then other epoxy kits I see online or in Home Depot. A: We manufacture our epoxy to a much higher standard than retail type epoxies. We don't use any substitute chemicals or water in our epoxies. Epoxy is no different then anything else you buy, there are many different grades of Quality for every product. There are many different ways to make the same thing cheaper. We don't cut any corners and use pure epoxy materials of the highest grade available. We specialize in long life commercial grade floors which require us to manufacture in this manner. It's why are floors look the best and stay looking the best the longest! I guarantee if you buy an epoxy kit because it's a brand name you recognize or because of the price you will be sorry in a short period of time, I see and hear it everyday! If you take a moment to compare what you get when you purchase an ArmorGarage epoxy kit versus what you get from other popular brands you will quickly see we are in fact the Best Priced Epoxy Kits on the market! See the Epoxy Comparison Chart We supply you with the most materials and application tools of any kits on the market. Shipping is included with our kits while other companies charge you extra at checkout! We are also the only company that supplies calibrated notched squeegees for applying the epoxy properly and at the required thickness. It all results in a superior finished product with greater flexibility, bond strength, surface hardness and a showroom finish second to none. Another reason we're more expensive is that we include what we believe is the mandatory topcoat. Most other epoxy kits don't include the topcoat amongst several other critical items so as to be able to advertise a low price. It's a good marketing strategy but no way to get a long life epoxy floor. As with most things in life it's as simple as, you get what you pay for! This is especially true with epoxies. Q: Do I have to fill in all the cracks in my floor, do I need to remove oil & grease stains completely, how do I clean the epoxy and how would I repair it if damaged? A: Lots of good questions here. If the cracks are hairline cracks Armor Ultra, Armor Chip and Armor Granite will fill them in. If they are larger cracks you need to purchase one of our Crack Repair Kits. Repair all cracks and divots first. For best results run a small hand grinder through the cracks to V them out. Then apply our crack repair compound or our instant crack repair compound. Both are heavy duty epoxy based products that will not crack or chip out like most other repair products. You can fill in saw cuts and control joints with these products if desired, expansion joints with expansion material need to be filled with our flexible joint filler if you want to fill these in. Then all oil & grease stains must be removed with an oil/grease remover. All our kits come with high quality topcoats which require only wiping with a damp towel to clean. Should the floor need a heavy duty washing simply mix some dish washing detergent with water and rinse off with your garden hose. No harsh chemicals or solvents are needed or should be used. If you damage the floor with scratches it can easily be repaired by lightly sanding the effected area and recoating with the topcoat which brings it back to new. That's another reason why a topcoat is critical, your base coat of epoxy is always preserved and only the topcoat needs to be reapplied if and when needed. Q: Why does the thickness of the epoxy matter? A: Epoxy thickness is very important. It's the amount of material between your finished surface and the floor. The more material(epoxy), the more tire heat and abrasion the coating can absorb. Thin coatings will get discolored, blistered and dulled much more quickly then a thicker coating. Plus just like with any type of material subject to wear, a thicker material will last longer than a thinner material. That's another reason to buy ArmorGarage's epoxy kits, we are the only company that provides you with a calibrated notched squeegee that ensures that you apply the epoxy at the proper thickness. With other kits claiming greater coverage and not using a calibrated squeegee you are just getting a paper thin coating of unknown thickness subject to bubbles, hot tire failure and other maladies. ArmorGarage kits have the thickest and finest finished coating on the market! Q: If your epoxies are so great why don't they come with lifetime guarantees! A: First let me just state that there is no such thing as a lifetime epoxy. That is just marketing fluff. If you read the details of those guarantees you will see that they exclude everything except peeling, adhesion is just one part of the battle. They do not guarantee against wearing, dulling, yellowing or cracking. They also make it next to impossible to qualify for the guarantee. You must prove you prepared the floor properly, mixed it properly and applied it properly, how do you do that? So when your lifetime guaranteed floor fails in any way you will find out you have no guarantee. Our epoxies are guaranteed for 10 years against everything except wear, which we guarantee for 7 years and by the way we are the only company that offers a guarantee on wear. Wear(durability) is what you should be most concerned with and we have more floors over 15 years old than any other company!